This is serenity at a cellular level, the essence of hearing beyond and into forever. The special limited-edition release of The Delicate Beyond, included free with initial hardcopy purchases of The Delicate Forever, sold through in no time. After many requests, Steve created a second edition with a subtle remix of the 74-minute piece, an extension of the opening track from The Delicate Forever. Howard Givens at Spotted Peccary added an audiophile mastering job. 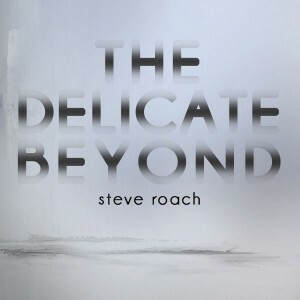 Recently available in a limited edition run of 500 copies (no idea if any are left at this point), electronic artist Steve Roach’s The Delicate Beyond is a companion work to his recently released album The Delicate Forever, and it contains only one single 74-minute track. The sole piece, The Delicate Beyond, split into two sections here, appeared in a 24-minute edited form on that full album, and with its very subtle and repetitive arrangement, it was one of the more difficult pieces on the disc, and it’s even more challenging in its extended form here. Lovers of drone music will respond best to it, but those unfamilair with this style of electronic music should tread carefully. Despite the longer length, it almost feels like there’s a quicker pace moving throughout the full `Delicate Forever’ here. Devoid of percussive elements or light beats for it’s entirety, a blissful humming synth fades in and out for an eternity, rolling over and around the listener as if the breath of life itself, moving just the smallest step closer with each careful approach. A welcoming opening, much warmer and more inviting that the edited version, it brings serenity and a lulling comfort as it drifts along. Some of the synth washes have a cooing, soothing tone, other times they almost take on a lonely wounded gentle howl. Electronic raindrop-like glistenings playfully ripple in the background as if stars in the sky, and once the drones begin sustaining in the second half, the synths start lapping around the listener to leave them floating softly. All the electronics perfectly work in unison, never in conflict, all wrapping around each-other and unwinding in multiple directions. A chirping synth loop finally emerges, bringing a lightly psychedelic and disorientating sweeping dreaminess before a come-down reprise to end on. This very minimal and subtle ambient soundscape is captivating, bringing reassuring carresses and will lift the listener adrift in the air with a soaring siren-like quality. Perfectly satisfying as its own album, yet also complimenting The Delicate Forever disc beautifully as well, this is an evocative, spiritual and thoughtful extended ambient piece. Even though there’s long repeated sections with seemingly little change or variation, to find it repetitive and uneventful would be missing the point altogether. Just allow yourself to be taken over by the atmosphere and the mood, and discover the patience to quietly listen and contemplate this long hypnotic journey. It’s always slowly unwinding and constantly evolving, with a fragile yet inviting meditative beauty, and it’s yet another example of sublime work from a pioneering electronic/new-age/ambient musician.